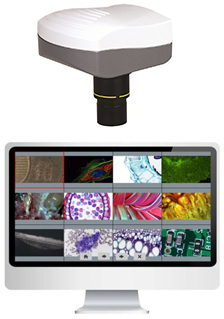 Our range of microscope cameras allow you to capture publication quality images and video with your existing microscope! 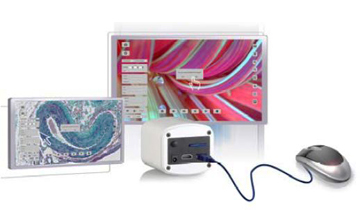 Now introducing our range of Microscope Screens - turn your existing microscope into an LCD Screen microscope with HD LCD Screen attachments, ideal for group work, training, or capturing publication quality images and video! BHC3-1080P HDMI Microscope Camera is a 1080P scientific grade digital camera that has top range colour reproduction and super fast frame speed. BHC3-1080P can be connected to a LCD monitor or HD TV via HDMI cable and operated independently without connecting to a PC. The image/video capture and operation can be controlled by mouse, to eliminate shaking. It can also be connected to a PC via USB. With fast frame speed and short responding time features, this is an ideal high precision addition to any microscope. 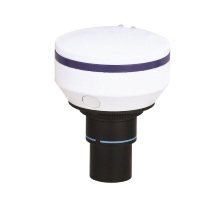 This Digital Microscope Eyepiece Camera fits records photo, video and time lapse views from in HD from the eyepiece slot of any microscope. It includes built in lens, adaptors, user friendly analysis software and all cables. USB and Power cables included. This large, super-high quality 11.6” retina HD LCD screen comes with a 6.0MP HD Digital camera for 1080P HD video recording and image capture. 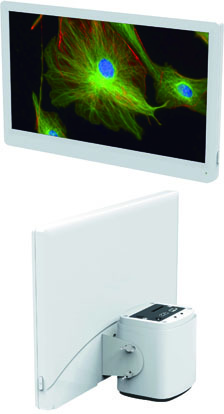 It can be connected to a PC, TV or projector to measure, analyse and present the microscope view. 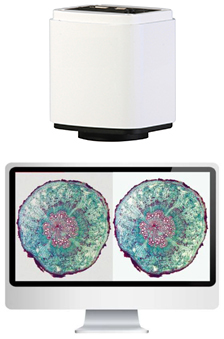 Excellent image quality, with an easy to use system that will fit your existing microscopes. Ideal for many situations, including demonstration, teaching, professional recording and high end laboratory work. BLC-350 HD tablet camera is a brand new, high performance and cost-effective, 9.7” HD smart microscope tablet digital camera. Utilising the Android operating system, it runs smoothly and with an easy to use interface. With professional, dedicated, built-in software, including multi-functional measurement and particle analysis, this is a versatile and highly useful addition to any microscope.